One of the few artists to gain true celebrity from illustrating children’s books, Kate Greenaway was one of the most influential illustrators of her age. Greenaway, along with Randolph Caldecott and Walter Crane, revolutionized illustration. Popular in both Europe and the United States, Greenaway has remained highly sought after, even among contemporary children’s book collectors. Born on March 17, 1846, Greenaway was an only child. Her father was a draughtsman, while her mother was a seamstress who owned a tailoring shop. Both parents encouraged their daughter’s artwork, and in 1867 Greenaway completed her first accompanying illustrations for Infant Amusements, or How to Make a Nursery Happy by William Kingston. The following year, Greenaway began exhibiting watercolors in London’s Dudley Gallery. Over the next twelve years, Greenaway would illustrate over 30 children’s picture books. She also created Christmas cards and bookplates, which were both incredibly popular. Greenaway’s singular style differed considerably from other illustrators of the day; her pictures were simple and elegant, and they captured a quiet innocence. Greenaway always depicted happy, well loved children in natural scenes, which resonated with people of all ages. Though Greenaway gained considerable notoriety doing illustrations for other authors’ works, she also longed to write her own book. In 1879, Greenaway made her debut as an author with Under the Window. 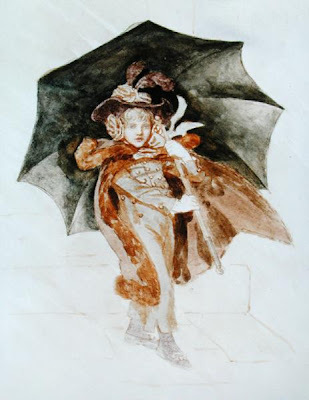 Like her illustrations, Greenaway’s verses were simple, elegant, and charming. The book was an instant success, selling approximately 150,000 copies. Both French and German editions of the book were published. Subsequent titles were equally successful, and Greenaway received a tidy sum for her works. She also published yearly almanacs from 1888 to 1897 (excepting 1896). Greenaway’s publisher, George Routledge & Co, had earned prominence for publishing yellowbacks, that is, colorful, eye-catching and less costly, glazed-paper volumes, which, to a very large degree, helped make literature more accessible to people of more modest income levels. Famous engraver Edmund Evans, known for his significant artistic contribution to the genesis of the yellowback phenomena, used chromoxylography to reproduce the images for Greenaway’s books. Likely because her mother was a seamstress, Greenaway paid particular attention to the clothing of her characters. Rather than stick to the fashion of the time, she chose instead to depict characters in clothing from the early 19th century. Though unconventional, the choice proved instrumental in influencing Victorian fashion. As Greenaway’s books gained international renown, they also attracted the attention not only of book lovers, but also the fashionable set in London. Parents began to dress their children in outfits that could have come straight out of Greenaway’s illustrations. Liberty of London, a well known department store in Britain, even adapted her “looks” for a line of children’s clothing. While Greenaway stayed quite busy illustrating and publishing children’s books, she still found time to contribute to the art world. In 1890, she was elected to the Royal Institute of Painters in Water-colour. Greenaway’s work captured the attention of legendary figures like John Ruskin and Arsne Alexandre, and she was compared with Stothard, Reynolds, and even Botticelli. 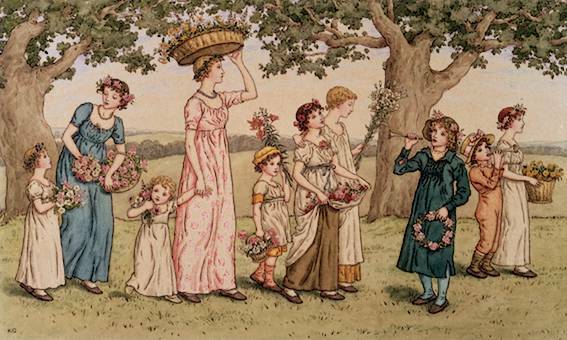 The variety and beauty of Kate Greenaway’s work have made her a perennial favorite among collectors of children’s books. Her books, greeting cards, book plates, and other art offer limitless potential for building an interesting and dynamic collection. This entry was posted in 19th-Century Literature, Children's Books and tagged children's illustrators, children's picture books, Kate Greenaway on April 17, 2013 by tavistock_books.